After 8 months here in Bali I’ve found some great spots. And I get a lot of questions about good places, so this is my list of things to do, see, eat and stay. First make a pick between the beach or the jungle. It’s not a great distance but some prefer one to the other. I like to live close to the beach and visit the inland. The tourism started close to the airport and have been spreading beach per beach, up north on the west side. Kuta is the first beach. Crowded, touristy and I pretty much never go there. Next beach is Seminyak. A little bit more upscale, good restaurants and better shops but still pretty much crazy. 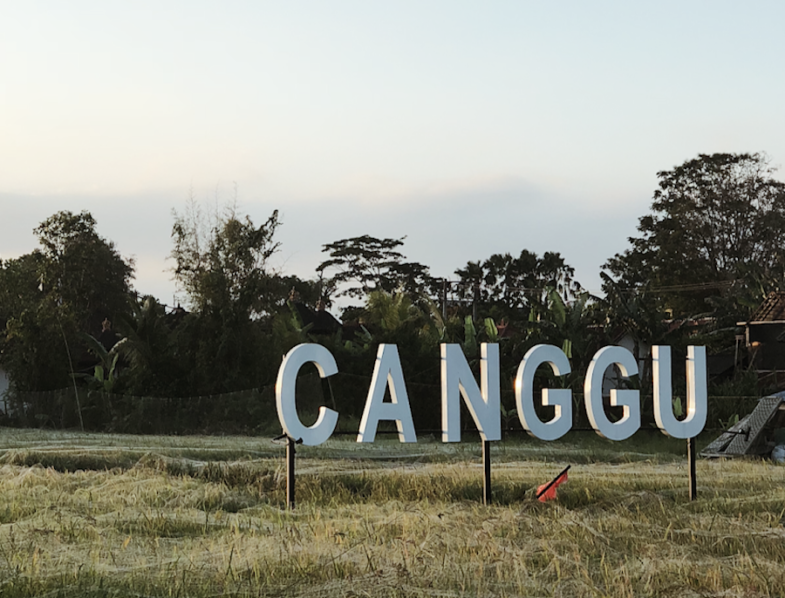 I prefer the Canggu area that is even more up North – it’s growing rapidly but still feels softer and more hipsterish. Pererenan is one step more north and slower more local, very nice – takes 5 min to the main Canggu happenings road of Batu Bolong. Is the town about an hour inland (from the beach) also a cultural x-pat hub. It’s green and vibrant with some excellent spots. Eat Pray Lovish. I have not been much ut love going there. Don’t miss Monkey Forrest – its beautiful and full of , yes you guessed right – monkeys. Tegallalang rice terraces north of Ubud are spectacular – touristy but still worth it. Campuhan Ridge Walk also nice. But just the town it self is more lush and green. Also take a course at beutiful Gaya Ceramics and eat a fantastic vegetarian lunch at Moksa close by. Spare Rib lovers should visit Naughty Nuris at night. Canggu has one main road – Jl. Pantai Batu Bolong – down to the Beach (beach =pantai) also called Batu Bolong. On the main street are lots of good shops and restaurants. Big restaurant that turns into noisy bar at night named after the surf break Old Mans that is out in the water on the right side of the large rock. Good food, nice ambiance. Lot of space- ping pong table and so on. They also have a local design market – one Sunday every month. Vegan modern diner hamburger joint. Pink buns, nice doughnuts and great food with happy interior. Mexican food, tacos & Margerithas happy hour every day. Excellent churros and good food. Try the jackfruit tacos. Our favorite lunch place.We come here all the time. I love to eat the Teriyaki Salmon but pretty much everything is good here also the desserts. I don’t know if its the BESt pizza around (maybbe Crispy’s are better) but it is a very cool place and nice location. They have a ping pong table and serves pizza by the meter if you like it like that. A lot of space for kids to roam. Huge place, surf & motobike shop, a small skate ramp at the back. Next to Luigis pizza. Very cool space but the food is unfortunately bad. But check out the store! Very cosy garden and plant based food. Shakes and juices of all sorts. Just off batu bolong – close to Echo beach. A box of concrete with hip people and smoothies to die for. Actually almost full from morning to afternoon (when they close) but a great spot for people watching. They also have a clothes store next doors and it’s the same owners as the concrete mega cool bar Pretty Poison (imagine concrete and a big skate bowl in the middle of the bar – mad max-ish) And also check out Gypsylandsfestivals for special parties. Plant based cafe & bicycle store. Very good food and nice place. I never have salad for lunch but I do here. Another beautiful place to eat. Food is good, not oh la la I’ll faint great. But I like it. They have pizza Tuesdays that I never tried but is supposed to be good. A little playground for small kids at the back. Just in front of Milk and Madu is Roti Daal – a good and simple Indian restaurant. Go for it! Hip Mini mall in the open with cool stores and great food. Newly opened Aug 18 so new stores/restaurants comes all the time. A great big playground and a mini but good skate bowl at the back. They have kids Sundays and movie nights as well. We love the Shmurgers Burgers. Gypsy inspired beach Club – their words, I don’t agree with using the term for commercial fun… Small caravans, good food lovely vibes. All wood is painted on with flowers and such. Trés cool. And a nice beach kind of empty beach in front of it all. Once a month the also have a market here that is nice to check out. Right image – a small garden in the rice fields. Laid back and good local indonesian food for a great price. Pretty easy. Also have some western food. Great little coffee place in Pererenan with nice lunches. Open from 8-15. The Loft – Across from the Common on Batu bolong. Also great food. This is a great store with lots of inspiration and nicely done. I don’t like the food but maybe good for a coffee! Hard to tell if this is New York, Paris or actually in Bali. A nice bistro feel to it. So I’m rather new to surf so I will not give you a list of the most fantastic breaks ever but I’ll tell you this. Noobs normally start at Kuta, Seminyak or maybe Batu Bolong. I do recommend to take a teacher in the beginning. The ocean is a powerful force and no beach or waves are like the day before. There are lots of teachers down at the beach that costs about 200′ for a couple of hours. Board rental is mostly 50′ for a couple of hours as well. The teachers down at the beach can be good but can also be dangerous. They will take you out pretty must under any condition. Then you have the teachers that costs about 400′ that you book in forehand. In my opinion this is o much better. I strongly recommend Jaya for Canggu area. He talks good English, is sweet and knows what he is doing. For kids there is Cody who runs Thumbs Up (naturally kids can take the other teachers too) But Cody does group sessions with multiple kids every day in the week (1 teacher for 1-2 kids) and also private lessons. This is a great thing to get them started. There are many places to to yoga around Canggu and Ubud and all over Bali. I just tried 2 places so far. is my absolute favorite. They have a lot of flow classes with great teachers. And the place is a sort of almost museum like to old style of Indonesian houses aka Joglos all very well put together (you can also stay here). that mostly do Ashtanga Yoga with Mysore in the mornings. It a good place with good teachers, a nice organic cafe and every Sunday morning they have Farmers Market with vegetables, fruit, some fish, nuts and such plus local knickknacks such as bracelets and so on (8-13h). Is Supposed to be really good too but I have not tried yet. They have a lot of Hatha Yoga. Building meat. Great gym for crossfit or just lifting weights is Wanderlust. westerned prices but great classes. Also Bali MMA is next doors. There are plenty small “hole in the wall gyms” that cost you next to nothing spread around Canggu – like Victroy Fitness on Jl Pantai Pererenan No.89. A cool surf shop – well there is plenty but I like this one i Onboard Store down on Batu Bolong. You can rent bikes everywhere. Officially you need an international driving license but I don’t think many has one. In The beginning it is harder than you think. But go slow and follow the rhythm.. The driving on the left side rhythm. Always wear a helmet. We’ve seen alot of accidents and it’s just stupid not to. Driving like 35km/h is mostly enough. You can buy petrol in old vodka bottles everywhere for 10 000idr. And there is a flow to the craziness that you understand after a while. A beautiful store in Ubud called Threads of life also have a great Instagram and they have different courses in batik and natural dye. Week long courses or smaller ones every Wednesday. Just send them a mail to know more or check out their website. I’m not much for beach clubs. Too restless and I think its a bit too expensive but still nice to do sometimes. We’ve been to Sundays Beach Club down in Uluwatu. Good food, super chill and as you can see beautiful beach! You can also go down to the same beach and just rent at simple chair and skip the beach club. All up to you. Everyone uses Whats Up, that’s the main way to communicate. Buy a Telekomsel (most reliable brand) pin card 10Gb more than enough, is about 100′ IDR. You will need it to communicate with drivers and others. There are loads of drivers. Often local that know the hood you live in and knows alot of good places and things to do. They can help you book stuff too and they wait for you if you go to a restaurant and so on. You can also Gojek yourself by car or motorbike. But not all neighborhoods will do pick up by gojek – they want you to use the local drivers. Beachwalk is the one most fashionable – down in Kuta. Also has a big Vip Theater with large chairs. @okarstylsuits – Oskar makes very cool suits here in Bali.